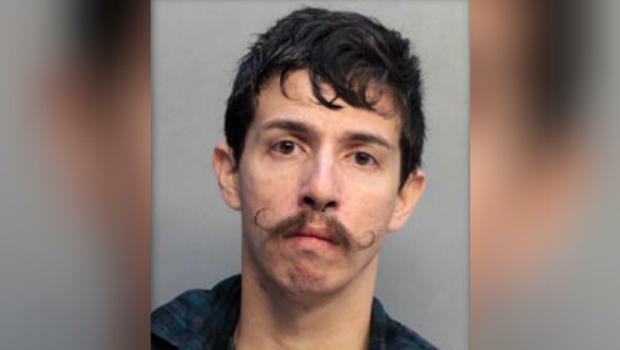 MIAMI – An unruly passenger was removed from a Miami to Chicago flight after being tased by Miami-Dade Police, according to authorities. CBS Miami reports another passenger on the plane posted video of the incident on Twitter. Warning: This Twitter video contains profanity. According to American Airlines, there was a "disagreement" between Jacob Garcia and another passenger while Flight 2446 was still at the gate at Miami International Airport. The "disagreement", according to the arrest affidavit started when Garcia touched a female passenger inappropriately without her permission. Garcia was moved to another seat, but he started to scream and insult the female passenger and her boyfriend, states the police report. When flight attendants asked Garcia to get off the plane, he refused. According to the airline, the crew followed procedure and began deplaning. When Miami-Dade Police tried to remove Garcia from the plane, he locked his legs around a seat and refused. An officer was forced to tase Garcia as they struggled to get him off the plane, according to the police. The report states the officer deployed his taser 10 times, "due to Mr. Garcia's actions and the close quarters of the engagement, Officer Desorches was unable to holster his ECW (Electronic Control Weapon) which caused the number of cycles." When Garcia still refused to walk off the plane, officers carried him out all while yelling at the officers and other passengers. Once in the terminal, police say, he collapsed to the ground in an effort to impede the officers' efforts. At point, police say, Garcia was able to reach for and grab an officer's handgun. The officer was able to knock the gun from his hand but Garcia "once again reached for the weapon." He didn't get it the second time. He was arrested and charged with Battery, Disorderly Conduct, and Resisting Officer among other things. On Sunday evening, a disagreement occurred between two passengers on American Airlines flight 2446 from Miami to Chicago O'Hare. The aircraft was still at the gate in Miami, and the instigating passenger was asked by our Miami team members to deplane and he refused. In accordance with our procedures, American began the process of deplaning the entire aircraft. During that process, a physical altercation between the same two passengers took place. Once law enforcement was on the aircraft, the passenger then became combative with the officers from the Miami-Dade Police Department. The same passenger was subsequently arrested by law enforcement. We will cooperate with the Miami-Dade Police Department on this matter. The flight, which was scheduled to depart at 9:30 p.m. ET, departed at 10:34 p.m. ET with all remaining passengers. We thank our crews and airport customer service team for their excellent work in this situation.